Soges Outdoor Porch Swing sells on Amazon. I think the price is very good. Please read some of the reviews and see people thought of the product. 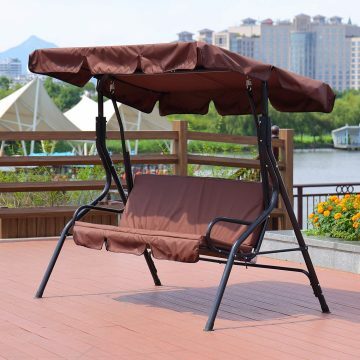 【Good material】Constructed of anti-rust steel frame with a polyester top cloth for sunshade and rain proof. 【2-person Available】Available for two persons, cushion is made of thick cotton and covered with 160 gsm water-resistant and fade resistant fabric for comfort and durability. 【Modern Design】The modern arch steel frame and curved handrail are designed with a unique style, to complement your whole courtyard. Perfect porches, patios, gardens, yards, pool sides and other outdoor living spaces. It will be your best bet. 【Dimensions】67” L x 43.3” W x 60.2”H, Max weight capacity: 330lbs. 【Easy assemble】Easy to assemble, free-standing swing seat with cover and stand. Perfect for the pool side, deck or patio, this swing will let you and your guests sit back, relax and enjoy the great outdoors.